Knowledge : Houmongi - KIDORAKU Japan - What a Kimonoful World! 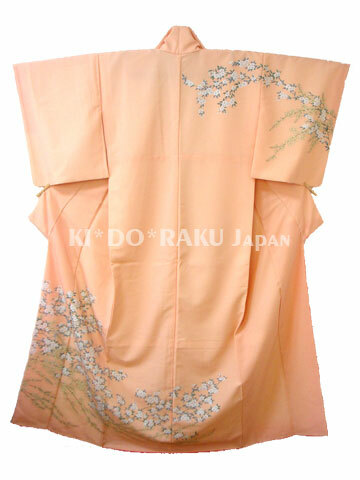 Houmongi is a semi-formal kimono with designs from shoulder to bottom. tea ceremonies, formal blind date, and so on. It's equivalent to visiting dress of Western clothes. Houmongi was born as a Japanese visiting dress, at the latter part of 19 century. "Houmon" means "visiting", and "Gi" means "wear". The designs of Houmongi is drawing to be not interrupted at seams. Such designs need a high technique and high cost. So, easy Houmongi that has no design at seams appeared. It was born at the beginning of 20 century, and called "Tsukesage". At first, Tsukesage was more informal than Houmomgi. But recently, Tsukesage is becoming more gorgeous. And now, it seems there is not great difference between Houmongi and Tsukesage.